We represent the largest group in Texas and the top 20 in volume in the US. We can meet any need. The Beaumont - Houston area is one of the fastest growing AMSOIL Markets. We are having our products stocked in more stores. Please enquire or call to order and pick up in any quantity. All our local dealers look forward to doing business with you. For populated areas this region has the lowest dealer to customer ratio so please consider joining us as demands keep increasing. Additionally if I should happen to not have your selection in stock, shipping is sometimes more convenient as it's usually only a day to Beaumont from the Dallas Distribution center. If in Louisiana, get excellent pricing too with great shipping rates. Please enter the main site for more information or simply call 409-543-4504. Should you have multiple vehicles or need to order frequently, be sure to print and complete the Preferred Customer or Dealer form. This gives you the benefit of ordering direct at the wholesale price while having hard copies of all the materials and our monthly AMSOIL Magazine to keep you updated on our product innovations and offers. There is a high demand for all of our synthetic lubricants in the Port Arthur area but especially the Motorcycle, Diesel, outboard marine and two cycle products. We usually have what you need in stock but generally we ship from our distribution center. For your gasoline vehicle try our 100% full PAO Synthetics with our 25,000 mile filters. You save gas and stop wasting money at other quick lube centers. As you look through the site please ask for your free AMSOIL catalog before leaving.With AMSOIL in gasoline engines you simply reach 25,000 miles or one year before draining your oil. We have a full line of AMSOIL Oil Filters made to our specifications by Donaldson who is known in the heavy-duty market as the innovator in filtration products and media. I recently heard a story about someone who said he wished his computer was as simple to operate as his phone. He got his wish. Phones are so complicated he can’t figure his out any more. By now you’ve noticed that life, at least here in Western Civilization, is more complicated than it used to be. The evidence is all around us. For example, when many of us were young there were only three TV stations, unless you were from a major metro area like New York. But when cable came along we suddenly had dozens, then hundreds. And with internet video options, it’s thousands. Medical care used to be easier, too. You went to the doctor and after a diagnosis he prescribed a medicine. Today we have a whole range of health services, from traditional to alternative, herbal to homeopathic. We’re ushered to specialists from allergists to urologists and everything in between. If we get prescriptions we no longer just listen to our doctors but go online to see what the side effects will be and what alternatives there might be, whether herbal supplements or aroma therapies. So it’s no surprise that our cars are more complicated as well. In the old days you popped the hood and with a minimum of training could figure out many repairs all by yourself. Just use a little applied logic and elbow grease. Nowadays, you open the hood and can hardly find your engine because it is buried beneath a mass of cables, couplings and devices. Exhaust gas recycling, direct fuel injection, variable speed transmissions, electro-magnetic valve actuators, connectors, brain boxes, sensors and chips... It’s a whole new world. There are a variety of ways people respond to complexity. Some people retreat from it, others get jazzed by it. Many of us have found, however, that as systems become increasingly complex they also become increasingly unpredictable. Ultimately, the law of unintended consequences and subsequent failings undercuts our confidence in what we think we know. This can lead to insecurity, though as Dave Barry notes, guys can often mask their insecurity by walking around with large tools in their hands. The study of complexity has become one of the newest branches of science. In his book Making Things Work, Yaneer Bar-Yam applies insights from this new science to everyday problems. Early in the book Bar-Yam shows how many problems occur because people focus too much on details without a reference to the bigger picture. It is the old dilemma of not being able to see the forest for the trees. In the auto industry, numerous problems have been created when engineers make modifications in one particular without seeing its full impact on the whole. I will cite just one example because it has a bearing on lube selection. That detail is aerodynamics. reducing drag to improve fuel economy has been a perpetual pursuit. Unfortunately, one of the adjustments to improve air flows was to bring the drivetrain up tighter into the belly of the undercarriage. Transmissions and differentials were suddenly running hotter, so hot in fact that interior carpets have caught fire during some tests where SUVs were pulling heavy loads. Synthetic transmission fluids and gear lubes are useful for addressing this issue, helping reduce internal friction to keep parts running cooler as well as more efficiently. In fact, synthetic motor oils and drivetrain fluids have been discovered as a solution for many of the issues auto engineers have encountered while in pursuit of improved engine design and function. The high torque and tight tolerances in the Corvette led GM to make synthetics the designated factory fill back in the 90’s. Several years ago Toyota had a problem with gummy sludge interfering with important sensors, with subsequent negative consequences for engine operation. Synthetic motor oils that resisted oxidation and sludge formation helped keep this negative at bay. IS MOTOR OIL TOO COMPLICATED? There are some who might suggest that synthetic motor oils and other specialty oils have made the motor oil field too complicated. I would suggest that this complexity can be simplified quite easily with a single question. Is your customer driving a vehicle with a mechanically sound engine? If yes, then he should be using a premium synthetic motor oil. It will protect his engine longer and keep it running more efficiently than a conventional motor oil. As for viscosity selection, just check the owner’s manual and you’ll be good to go. Unless I’m missing something, this prescription seems pretty clear and simple to me. AMSOIL Dealer Opportunities in 2015 provide you with the ultimate home business opportunity with 41 years of continuous growth and market leadership, without the need for significant investment of money. AMSOIL manufacturers Synthetic Motor Oils. They are exclusively distributed by Independent Dealers - People like you and me. Synthetic Oils are not created equal and AMSOIL is in high demand because of the unique qualities engineered into the base oils. Why is AMSOIL better? Because AMSOIL stays at the front of the lubricant trending industry introducing new technologies to the public where other well known brands avoid improvements due to costs and profits. If it's leading edge you will find it here! New emission systems demand oils, which can take more heat and leave fewer deposits. Currently diesel engine technology has created problems which we have the best solution. As the economy is weakened, people want to secure their vehicles for life. Lubrication is the #1 factor to reducing heat and friction. The AMSOIL Bypass-Filter kits are now a top selling item - people want to preserve their equipment and save valuable time. 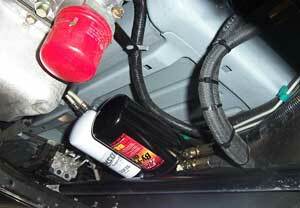 They are demanding better lubrication qualities from the oil to improve fuel economy and engine cooling. Commercial vehicles Require synthetics in transmission and drivetrain parts to retain extended warranties. Environmentally we can not go on disposing of the millions of gallons of oil each year that is the bi-product of 3,000 mile oil change intervals - Imagine if everyone changed their oil at say 7,500 miles instead. The used oil disposal problem would be cut by 50%. Yes 50%, not just 1 or 2% - Now consider the impact of a 25,000 or 35,000 mile oil change interval and a Automatic Transmission fluid which reduces temperatures 50 degrees and lasts three times longer. AMSOIL's other product line "AGGRAND Fertilizers" is quickly becoming 60% of all Amsoil sales due to rising cost for petrol-chemical fertilizers. AGGRAND is Organic in liquid form and costs many times less with better results. Fall and Springtime you can sell 100's of drums. AMSOIL has been manufacturing and developing synthetic motor oils like these for 41 years now!! AMSOIL makes sense from a financial, practical, technical, environmental and ethical sense. Consider being a dealer at the basic level today. Use this link dealer or preferred customer form to get started. Part time or full time, opportunities for dealers are everywhere. We share leads with our dealers in addition to the unbelievable support from AMSOIL. See our sample newsletters. Support: Customers join my group (Ches Cain) after calling around realizing I offer service! I even host our own training at my AMSOIL store. AMSOIL's many training materials will have you full of knowledge in no time. Be sure to request my starting inventory spreadsheet after joining with us. Although most of my sales today are still based on my customers testimonials. With AMSOIL you have access to monthly service bulletins, the AMSOIL U (School in May and online 24/7), Field Sales Tools, professional ads, new DVD's, power points, the Dealer Zone online, product whitepapers and more. I also provide you with my own monthly newsletter to convey our own experiences and recommendations. We'll pass you the tools needed to be listed on the internet so customers will find you. The demand continues to increase. The industry is moving people towards us. Why not become the source of value based synthetic lubricants? We'll give you the tools to enhance the AMSOIL opportunity.